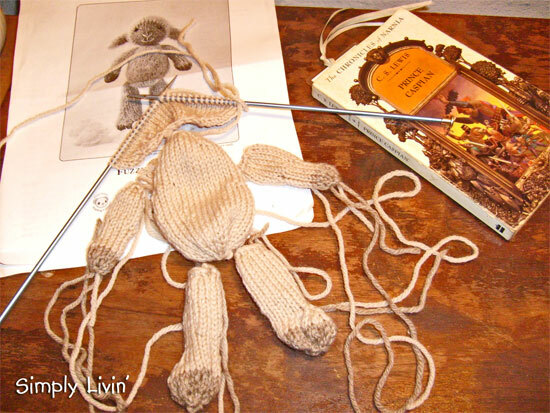 The lamb is knit using wool yarn and I am going to stuff it with our own sheep's wool. It's knit using a free pattern by fuzzy mitten. When finished, it's going to be a special nine month old baby girl's Christmas present this year! And the book is C.S. Lewis' Prince Caspian that Johnny and I have been reading together in these cozy evenings. Did anybody notice that a Tuesday went by without being tasty? lol! My apologies! :) More on what we've been up to coming in a later post. Such a sweet pattern! Thank you for the link. What an adorable lamb and how exciting to stuff it with your own wool. I am so glad I found your site and can't wait to sit down with a cup of tea [when it's quiet] and visit for awhile. That little lamb looks so cute! looking forward to seeing him all sewn up! I just want to thank-you for the link. I have been wanting to make such a toy for my toddler, and was aghast at the prices for toy pattern books. So I thought better of it. Now I can make her this lamb. AS we would say a " good kind" as all the naughty ones are in the barn! Fun! I have this in my queue too! I plan to make it for a Christmas gift. Great idea to stuff it with your own wool. That lamb is adorable! My mother read the Narnia series aloud to me when I was a child and it's one of my favorite memories of her. :) Enjoy it!